Surrounded by a crystal-clear lagoon, lined with pearly white sands and hugged by exotic flora, Reethi Beach certainly lives up to its local name: ‘Beautiful’. From the very first glimpse of this breath-taking Maldivian resort, you’ll be transported into holiday heaven. 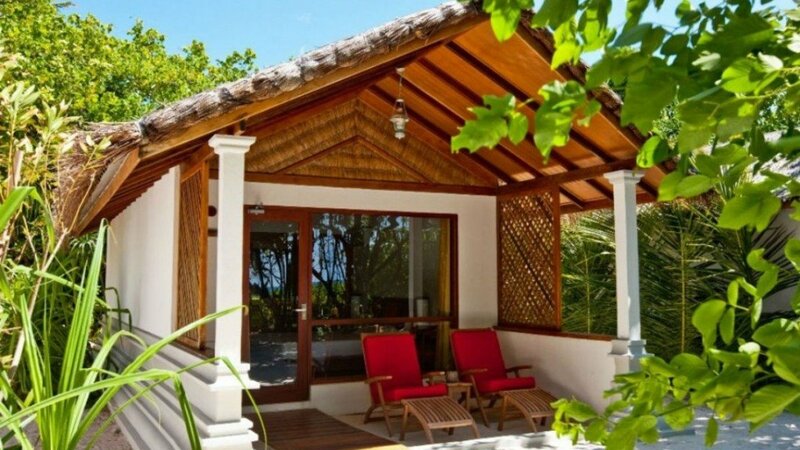 Set on the petite island of Fonimagoodhoo, measuring just 600m x 200m, all the fantastic facilities of Reethi Beach are within easy reach of the accommodation. Leave everyday life behind, with days spent soaking in the sun, diving in the magnificent Indian Ocean, or indulging in a treatment for two at the Coconut Spa. There’s a multitude of delicious dining options in the resort, as well as a choice of beach bars and evening venues. The hardest thing for you to do during your holiday will be deciding which to try first! At the end of every peaceful day, you’ll rest your head in one of the elegant villas that line the coast. Sink into a comfortable bed, and let the soothing sounds of nearby waves lapping gently lull you to sleep. 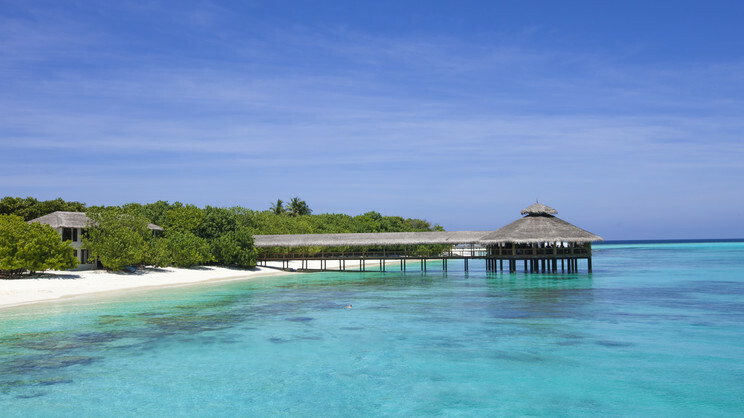 For a perfect romantic hideaway, or perhaps a honeymoon to remember, Reethi Beach could be the dream holiday of a lifetime you’ve been searching for. Dazzlingly white sand, and a crystal-clear lagoon lines this Maldivian island resort. Each of the villas is located just a few steps from the nearest part of the beach. 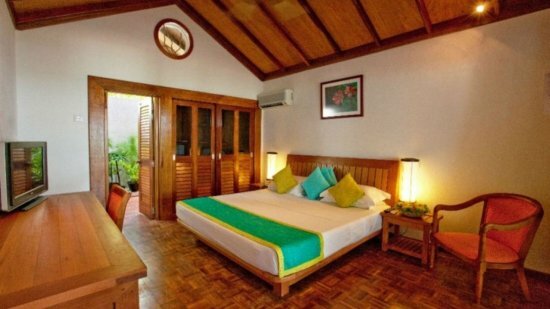 Reethi Beach is a resort within itself. Distances between the different parts of the resort will depend on the villa you choose, but the entire island is just 600m x 200m in size, so everything you might need is very close by! The best way to arrive at Reethi Beach Resort is via a scenic seaplane flight, which takes approximately 35 minutes from Male International Airport. After landing, theres a short boat ride on a traditional Maldivian Dhoni. Alternatively, there’s the option of a 20-minute domestic flight to Dharavandhoo, followed by a short speed boat ride. 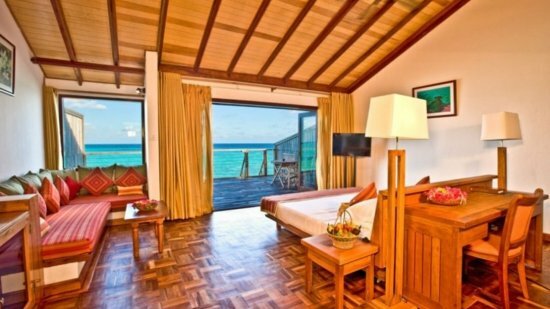 If you like to be close to the sea, choose one of the special Water Villas. Built on stilts over the shimmering azure waters of the lagoon, they boast direct access to the water from the outdoor decking. 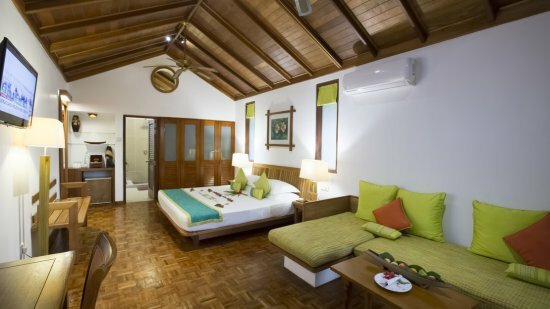 The largest of the accommodation options at Reethi Beach Resort, these villas include a large sitting area, king-sized bed and an en-suite bathroom. These spacious, detached villas are located right by the soft white sands of the beachfront. Enjoy the magic of a Maldivian ocean sunset from the romantic, traditional swing that hangs just outside the room. Alternatively chill out in your own comfy sun-loungers, while sipping a refreshingly cool drink from the fridge. There’s either twin beds, or a king-sized bed available and the partially open-air bathroom contains a bathtub and a shower. These stunning detached or semi-detached villas are surrounded by lush vegetation, and are located moments from the beach. The simple yet comfortable furnishings aim to complement the natural beauty of the island. There’s a king-size bed, or twin beds available, and a partially open air bathroom with luxurious toiletries included. Dine with breath-taking views across the gardens and down to the sea, at Reethi Beach’s main restaurant. Open for breakfast, lunch and dinner, the menu here is served in a buffet style for every meal. A different theme every night of the week, means there’s endless variety to tempt your taste buds. One evening you could be trying local cuisines at the Maldivian night, then you're transported back to Europe with a spread of Italian favourites the following night. Vegetarians will have plenty of choice, and other special dietary requirements are catered for. There’s a dress code in this restaurant, and swimwear is not allowed. Situated out in the sapphire waters of the Indian Ocean, this restaurant and bar built on stilts is a perfectly romantic setting for a meal. Serving coffee 24 hours a day, you can get your caffeine fix at any time while enjoying the relaxing sounds of the waves. The varied menu is a-la carte, and ranges from sandwiches to lobster thermidor. Enjoy an evening meal under the stars at this relaxed open-air restaurant. Chefs prepare your meal in front of you at live cooking stations, creating an exciting ambience filled with sizzling sounds and spicy aromas. The menu includes an eclectic mix of grilled meat and fresh fish, pizza cooked in a wood-fired oven, and Indian classics. It’s worth noting that there’s a dress code in this restaurant, and swimwear is not allowed. This laid-back poolside café serves up a tasty array of holiday snacks during the day, including burgers, pizzas and crepes. Perfect for a quick treat while you bask in the glorious sun. Indulge in a romantic dinner for two by the beach at this exclusive boutique restaurant. With just 5 tables available, you can have a truly intimate experience with your loved one. The menu here includes delectable Maldivian and International cuisines, and a pleasantly discreet service. There’s a dress code in this restaurant, and swimwear is not allowed. *Drinks include: Still or sparking mineral water, a selection of canned soft drinks, canned juices coffee, tea, house wine, draft, bottle or canned beer, a selection of aperitifs and spirits, and a selection of cocktails. The following are not included: energy drinks, fresh fruit juices, speciality coffee, tea, hot chocolate, Corona and Erdinger. Reethi Beach Resort’s all-inclusive plan starts at 12 noon on the day of arrival, and ends at 12 noon on the day of departure. Anything consumed after 12 noon on the day of departure will be charged at normal rates. Any services or items not consumed due to late arrival, early departure or due to bad weather is not refundable. **Drinks include: Still or sparking mineral water, a selection of canned soft drinks, canned juices coffee, tea, house wine served by the glass and selected bottled wine, draft beer, a selection of aperitifs and spirits, cocktails and mocktails. The following are not included: energy drinks, speciality coffee, tea, hot chocolate, Corona and Erdinger. Reethi Beach Resort’s all-inclusive premium plan starts at 12 noon on the day of arrival, and ends at 12 noon on the day of departure. Anything consumed after 12 noon on the day of departure will be charged at normal rates. Any services or items not consumed due to late arrival, early departure or due to bad weather is not refundable.